This is the prettiest dessert I’ve plated so far. I’ve never really mastered the art of plating, but for some reason, I couldn’t help myself when arranging this dessert. It might be because there are so many components to it, or because I was just excited to do something intricate for once, but this one is a stunner for sure, both on the eyes and on the palate. Sometimes I look at certain recipes and wonder, “Uh…. Yeah, right. Who has the time for that? ?” I’m thinking this recipe will probably give a lot of people the same thought. I honestly set out with a simple recipe in mind: a honey caramel swirled cheesecake topped with meringue bits. But when I tried this new method of making meringues, I botched the first try and baked the sugar for way too long which resulted in caramelized sugar bits. Luckily, the second time was successful. I have to say, it was worth the trouble because I’ve always had a tough time making meringues that don’t crack or stay perfectly white and this method worked wonders. 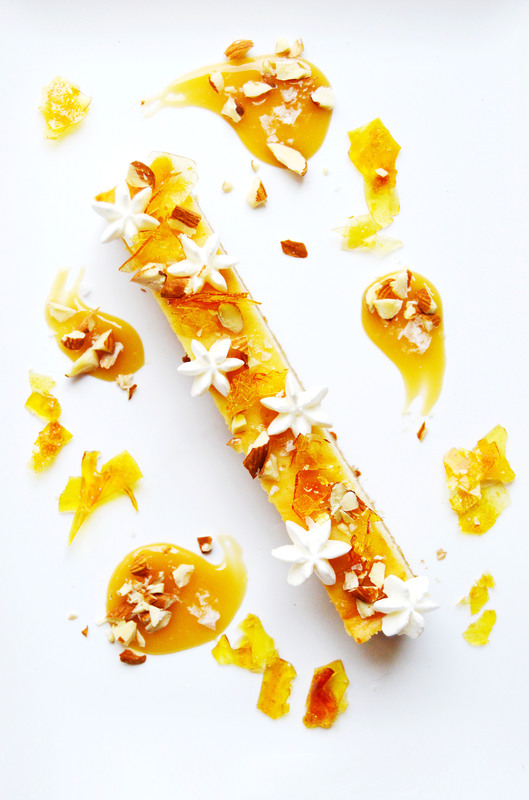 It’s crunchy, crispy, creamy, smooth, nutty, sweet, salty, rich and light. It’s pretty much a party in your mouth. Trim the edges of the cheesecake to get neat sides. 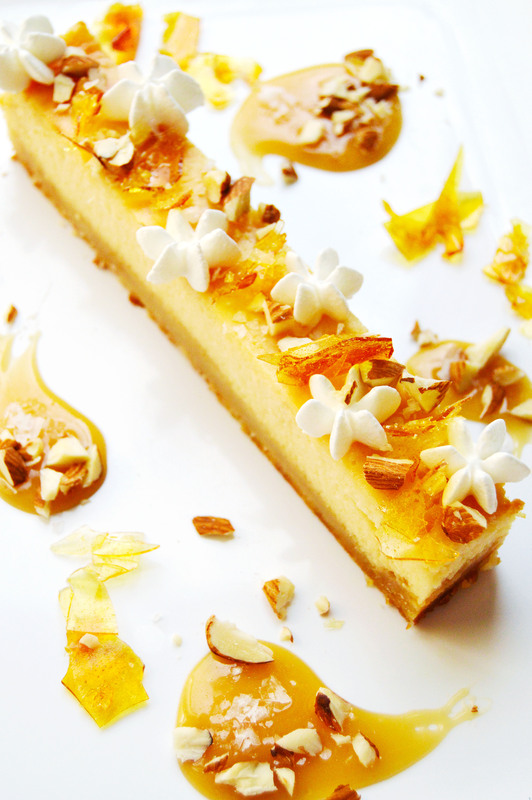 With a sharp knife, cut cheesecake into long strips, wiping the blade of the knife down after each cut. 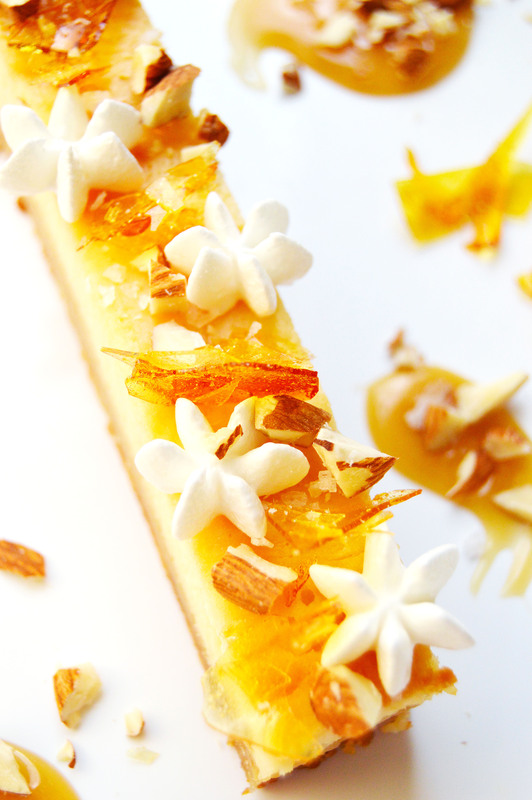 Top each cheesecake pieces with crisp meringue bits, caramelized sugar bits, almonds and sea salt. 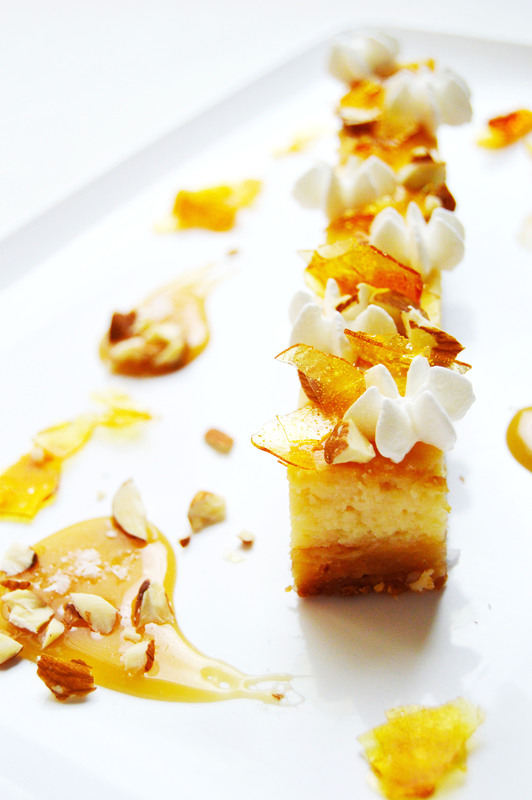 Optional: put dollops of honey caramel around the edges of the plate and top with sea salt and almond pieces. Preheat oven 350˚F and line an 8-inch square pan with parchment paper. In a large bowl, combine butter, sugar, flour, vanilla and salt until a dough forms. Press dough into an even layer on the bottom of the pan. In the bowl of a standing mixer fitted with the paddle attachment, mix cream cheese and sweetened condensed milk until homogenous. Add egg and heavy cream and mix until combined. Pour cream cheese mixture on top of the flour mixture. Put dollops of honey caramel and swirl with a toothpick to form swirls. Bake 20-25 minutes in a preheated oven until cheesecake is set. Cool on a wire rack and refrigerate until thoroughly chilled. In a saucepan over medium high heat, combine honey and cream. Cook until mixture reaches 238˚F. Cool, and refrigerate if storing for future use. Preheat oven to 400˚F and line a rimmed baking sheet with parchment paper. Spread sugar in an even layer over parchment. In the bowl of a standing mixer fitted with the whisk attachment, add the egg whites and the cream of tartar. Place sugar into the oven and bake until the edges of the sugar begins to melt but not brown, about 5 minutes. Once the sugar begins to melt, turn the mixer onto high. Remove baking sheet from the oven and the eggs whites should be foamy. Turn the mixer to medium high and slowly pour the hot sugar from the parchment paper into egg whites. Once all the sugar is added, turn the mixer onto high and mix until stiff, shiny peaks form. Reduce oven to lowest setting 140˚F. 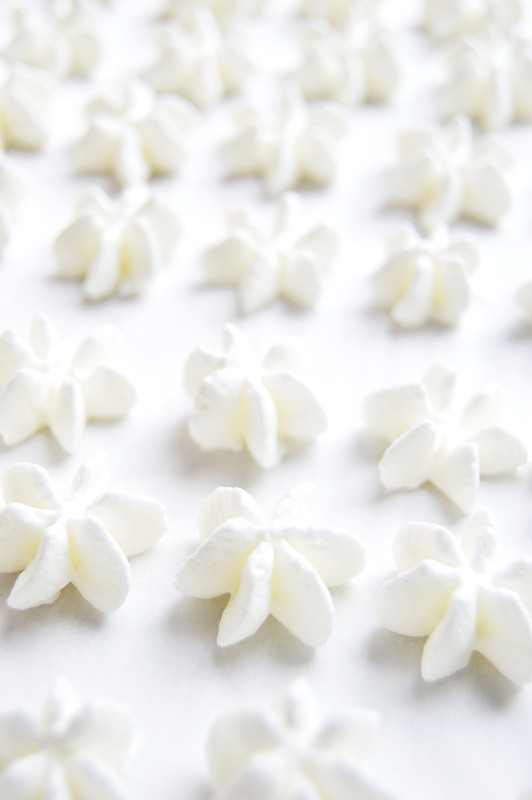 Fill a pastry bag fitted with a closed star tip, make small flower shapes until you have used up all of the meringue. Bake about 10-20 minutes until they are crisp and hollow. Turn off oven and let it dry out for about 30 minutes to an hour. Remove meringues out of the oven and store in a cool, dry place. Spread sugar in a thin even layer over parchment. Place sugar into oven until it becomes liquefied and golden brown. Remove and let stand until completely cool. 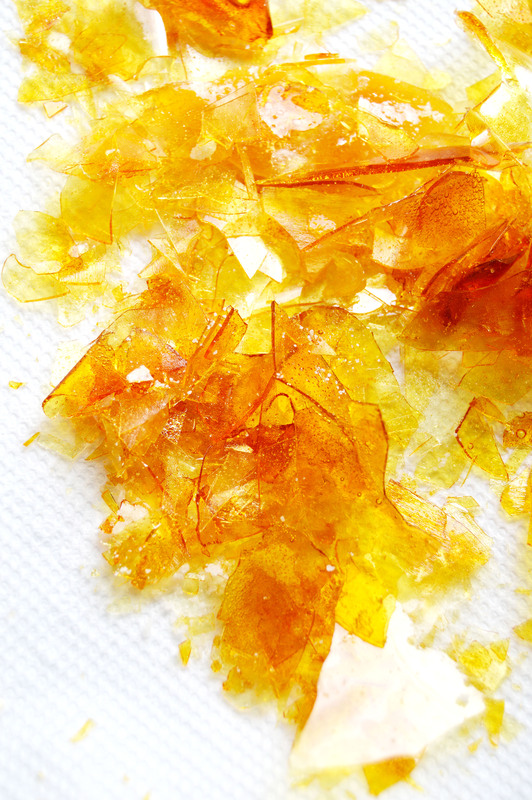 Break into small shards of crisp sugar. This entry was posted in Caramel, Cheesecake, Cookies, Desserts, Honey, Meringue, Nuts and tagged Caramel, cheesecake, Cookies, dessert, honey, meringues, nuts. Bookmark the permalink. You are a master at plating!!! This is the prettiest dessert I’ve ever seen! What a gorgeous dessert! I love all the components you combined in here, so many textures and flavors to love 🙂 Impressive as always!! Oh would you look at this! Haha, yeah these days I do not have quite as much patience for recipes as I used to. But there are definitely desserts that I totally deem worth the time, and this is one! You make the most beautiful things Giselle! This is like a work of art, wow!